Sporting Arms Company founder and CEO Jack Warne was born in Adelaide and now lives in the United States. 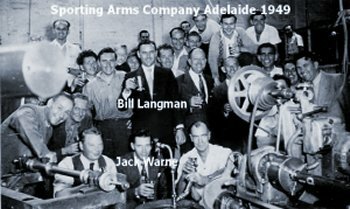 For more than 40 years Jack Warne's company made Sportco firearms in South Australia and sold them world-wide. The history of Jack’s role in the Sportco story can be read about under the history section of this site. Those who are interested in the history of Sportco should be aware that its founder is alive and well, living with his lovely wife Marjorie and enjoying life to the fullest. We thank Jack and his family for their support for this website and telling the story behind the company. Australian made Monaro near his Oregon home. A few remaining treasures from the Sportco days still have a proud place in the Warne household. A mint Model 63A rifle being examined by Jack Warne (right) and then Managing Director of Omark Industries Bill Langman (Adelaide 2006). Jack Warne and Bill Langman sharing memories surrounded by old factory memorabilia. Jacquie Fleetwood, Director of South Australian dealership S.A. Sportsgoods Distributors sharing moments with Jack Warne in Adelaide, May 2006. Sporting Arms Company Christmas drinks circa 1949.